Corning said Thursday that the company has begun shipping Gorilla Glass 4 to its customers and partners, with the goal of preventing shattered screens when a smartphone drops facedown onto a solid object. Corning claims that its new glass is about twice as strong as older aluminosilcate glass. The new Gorilla Glass will be used in phones or tablets to protect the glass from shattering in case they’re dropped. 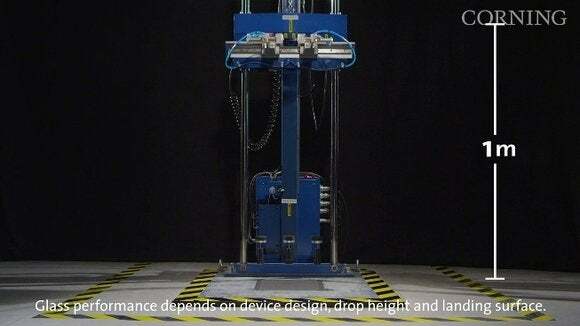 Corning said it had repeated numerous drop tests of phones from a meter’s height, testing each formulation before it settled on the final Gorilla Glass 4 recipe. It’s about twice as strong as other glass, the company claimed. While Gorilla Glass 4 survived the fall about 80 percent of the time, the soda-lime glass in other phones shattered in every test, the company said. Corning said over 40 manufacturers have designed Gorilla Glass—not Gorilla Glass 3, but all versions of Gorilla Glass, into over 1,500 separate products and over 3 billion devices in total since 2007. Why this matters: Rumors say that Apple has been investigating so-called unbreakable sapphire glass—which would, of course, put a crimp in Corning’s plans. Whatever. If Corning—or Apple, or any other manufacturer—can increase the durability of our smartphones and tablets, who are we to argue?